Tears glittering in her eyes, her thoughts drifted to her family and the terrible fate that had befallen them. The shadows no longer hid secrets. A quaint, middle-class neighborhood that surrounded the estate emerged and his hunger surged. He had to get away from these people too. He could no longer trust himself. Every fiber of his being yearned for the life-giving warmth of blood. He expected to feel remorse, but as he had fed and the hunger had faded, he had felt nothing more than satisfaction. In the mausoleum, the vampires slept. Both dreamed of their plans for their approaching night. One dreamed of blood and victory, the other dreamed of murder and revenge. This vampire is not messing around. No, sir. He is badass. No glittering in the sun, no dashing 100-watt smile. Pure and uninhibited evil. He wants to collect the Socoli children and he wants to collect them bad. With Alisha and Vanora dealing with the death of their brother, and the knowledge that the vampire killed him, things are getting a little more hectic. At the same time, these sisters are really bonding together to protect one another. 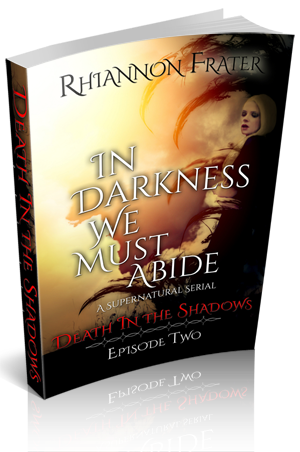 Death in the Shadows also allows more depth into their characters. I can already tell that Vanora, despite her young age, is going to be a force to be reckoned with. She’s a feisty spitfire and I’m very curious to find out what’s going to happen in the next three serials. One of my favorite parts of this series, is that it goes back to the roots of vampirism. Think Dracula. It’s scary and suspenseful and has the feel of a classic gothic horror novel. You are also very connected with the characters. Their attempt at survival against odds they never could have imagined facing. This episode ends more hopeful for the Socoli family, though there were a few scenes that just broke my heart, and I’m really pulling for this family, but at the same time I get a feeling that it’s not going to end as well as these characters imagine/hope it will.